volume 2, issue 1, March 2007. Our feature artist is a Master of History and French Modern Letters (1991, University of Grenoble) and has a number of published works including publication of his rendition of the arms of the dukes of Brittany in the Flemish review “Heraldicum Disputationes “ dated April-May-June 2006, Homuncu-lus Editions and he has been formally nominated heraldic painter of the Vlaams Heraldische Raad (Flemish Heraldic Authority), which has the approval of the Flemish government of Belgium. In this office he produces the official letters patent for this institution. Laurent began his heraldic career in 1995, the year he married Anne Goyet, and in 1996 he exhibited in the IIIrd Salon du livre d’héraldique et de chevalerie in the Museum of the Légion d’honneur et des Ordres de Chevalerie in Paris -a book show devoted to heraldry and chivalry in October of that year. The following year in 1997 Laurent was pleased to design, for her 86th birthday, the cipher of Her Imperial & Royal Highness the Countess of Paris, born Princess Orleans and Bragance ; publication of his bookplates in an article of “l’Ex—libris français”, review of the L’Association Française pour la Con-naissance des Ex—Libris. This review regularly pub-lishes Laurent’s more recent bookplates. Also during November of 1997 Laurent staged an exhibition and round table the subject of which was : “Heraldry today” with Dr Jean-Claude Loutsch (President of the International Heraldry Academy), Prof. Michel Pastoureau (Practical School of the High Studies in Human Sciences) & Michel Popoff (Curator of the French national Library) IVth Salon du livre d’héraldique et de chevalerie in the Mu-seum of the Légion d’honneur et des Ordres de Chevalerie in Paris. During July of 1998 he was pleased to see an article about his work written by Edouard Secre-tan President of the Société Française d’Héraldique et de Sigillographie « Vers un nou-veau style héraldique français » (“Towards a new French heraldic style”), in the prestigious maga-zine « La Demeure Historique » (magazine of the French owners of historical castles & houses) and in December of that year he mounted an exhibi-tion and gave a talk at the Vth Salon du livre d’héraldique et de chevalerie in the Museum of the Légion d’honneur et des Ordres de Chevalerie in Paris. 1999 saw an exhibition and workshop in the SCRIPTURA show (International salon devoted to writing and writing equipment), in Lyon, March 1999 ; the organization of a day of study in Lyon for the Société Française d’Héraldique et de Sigillographie in June (visit with the curators of the Library and its heraldic manuscripts, of the Museum of fine arts, of many churches and private houses with heraldic frescoes) ; a study of he-raldic frescoes of the 16th and early 17th centuries on the walls of a palace of the old town of Lyon commissioned by the Direction des Affaire Culturelle de la Région Rhône-Alpes and an exhibition in the VIth Salon du livre d’héraldique et de chevalerie in the Museum of the Légion d’honneur et des Ordres de Chevalerie in Paris during Novem-ber. During 2000 Laurent undertook his first personal exhibition in the town hall of Lyon along with the display of a selection of tokens engraved with the arms of the consuls of Lyon (specially lent by Lyon’s Museum of fine arts) ; created a bookplate for the prominent French heraldist Michel Popoff, Curator of the French national Library (department of coins & antiquities) and Secretary of the International Heraldry Acad-emy ; exhibited his work about the arms of the great French men of quill in the SCRIP-TURA show in Lyon from 31st March to 2nd April and exhibited his work in the XXIVth international congress of genealogical and heraldic sciences in Besançon (France) in May of that year. 2001 saw membership approval in the Maison des Artistes, membership of which gives a specific social and tax status to independent artists. This was also the year which saw the creation of his website which receives an average of over 50 000 page views from all over the world each year. This year saw the illustration by Laurent of eighteen black & white designs for an article written by the French historian and heraldist, Nico-las Vernot entitled Les allusions politiques dans les armoiries comtoises enregistrées dans l’armorial général de 1696 » (“political allusions in the Franche-Comtée arms registered in the 1996 armorial”) in the heraldic Swiss review Archives Héraldiques Suisses 2001, tome II. 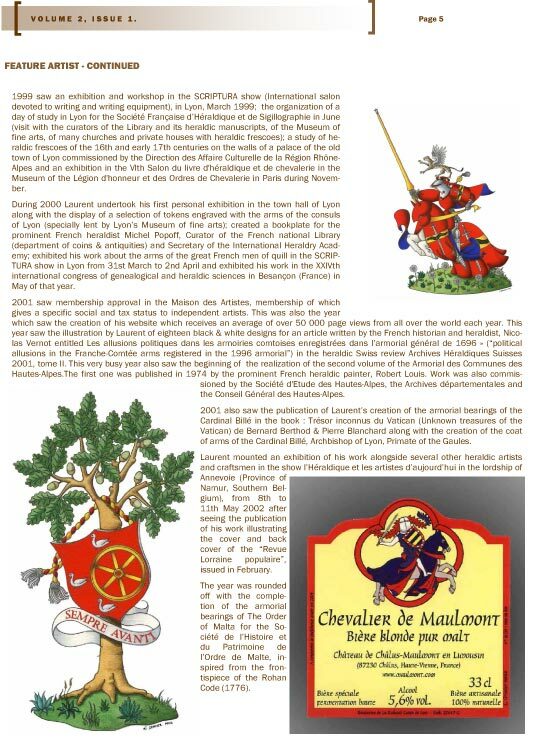 This very busy year also saw the beginning of the realization of the second volume of the Armorial des Communes des Hautes-Alpes.The first one was published in 1974 by the prominent French heraldic painter, Robert Louis. Work was also commis-sioned by the Société d’Etude des Hautes-Alpes, the Archives départementales and the Conseil Général des Hautes-Alpes. 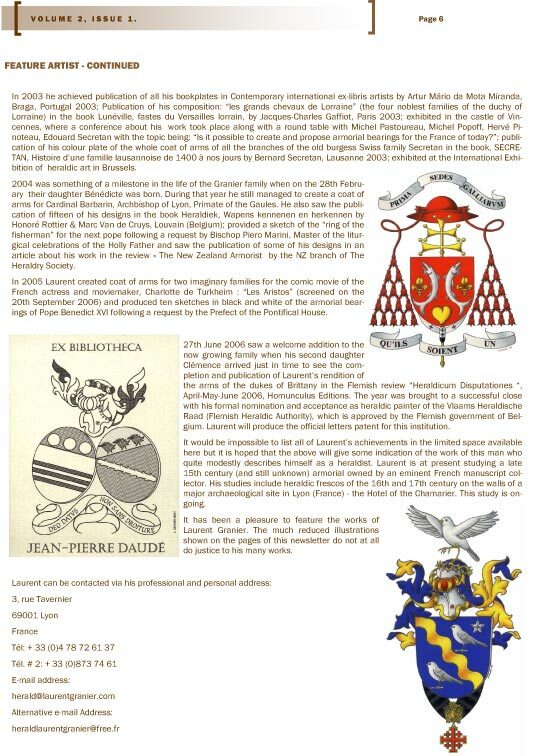 2001 also saw the publication of Laurent’s creation of the armorial bearings of the Cardinal Billé in the book : Trésor inconnus du Vatican (Unknown treasures of the Vatican) de Bernard Berthod & Pierre Blanchard along with the creation of the coat of arms of the Cardinal Billé, Archbishop of Lyon, Primate of the Gaules. 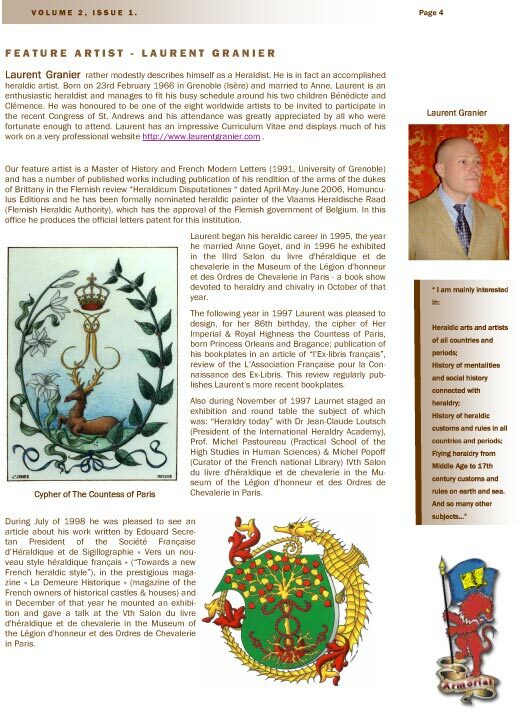 Laurent mounted an exhibition of his work alongside several other heraldic artists and craftsmen in the show l’Héraldique et les artistes d’aujourd’hui in the lordship of Annevoie (Province of Namur, Southern Bel-gium), from 8th to 11th May 2002 after seeing the publication of his work illustrating the cover and back cover of the “Revue Lorraine populaire”, issued in February. The year was rounded off with the comple-tion of the armorial bearings of The Order of Malta for the So-ciété de l’Histoire et du Patrimoine de l’Ordre de Malte, in-spired from the fron-tispiece of the Rohan Code (1776). In 2003 he achieved publication of all his bookplates in Contemporary international ex-libris artists by Artur Mário da Mota Miranda, Braga, Portugal 2003 ; Publication of his composition : “les grands chevaux de Lorraine” (the four noblest families of the duchy of Lorraine) in the book Lunéville, fastes du Versailles lorrain, by Jacques-Charles Gaffiot, Paris 2003 ; exhibited in the castle of Vin-cennes, where a conference about his work took place along with a round table with Michel Pastoureau, Michel Popoff, Hervé Pi-noteau, Edouard Secretan with the topic being : “Is it possible to create and propose armorial bearings for the France of today ?” ; publi-cation of his colour plate of the whole coat of arms of all the branches of the old burgess Swiss family Secretan in the book, SECRE-TAN, Histoire d’une famille lausannoise de 1400 à nos jours by Bernard Secretan, Lausanne 2003 ; exhibited at the International Exhi-bition of heraldic art in Brussels. 2004 was something of a milestone in the life of the Granier family when on the 28th Febru-ary their daughter Bénédicte was born. During that year he still managed to create a coat of arms for Cardinal Barbarin, Archbishop of Lyon, Primate of the Gaules. He also saw the publi-cation of fifteen of his designs in the book Heraldiek, Wapens kennenen en herkennen by Honoré Rottier & Marc Van de Cruys, Louvain (Belgium) ; provided a sketch of the “ring of the fisherman” for the next pope following a request by Bischop Piero Marini, Master of the litur-gical celebrations of the Holly Father and saw the publication of some of his designs in an article about his work in the review « The New Zealand Armorist by the NZ branch of The Heraldry Society. In 2005 Laurent created coat of arms for two imaginary families for the comic movie of the French actress and moviemaker, Charlotte de Turkheim : “Les Aristos” (screened on the 20th September 2006) and produced ten sketches in black and white of the armorial bear-ings of Pope Benedict XVI following a request by the Prefect of the Pontifical House. 27th June 2006 saw a welcome addition to the now growing family when his second daughter Clémence arrived just in time to see the com-pletion and publication of Laurent’s rendition of the arms of the dukes of Brittany in the Flemish review “Heraldicum Disputationes “, April-May-June 2006, Homunculus Editions. The year was brought to a successful close with his formal nomination and acceptance as heraldic painter of the Vlaams Heraldische Raad (Flemish Heraldic Authority), which is approved by the Flemish government of Bel-gium. Laurent will produce the official letters patent for this institution. It would be impossible to list all of Laurent’s achievements in the limited space available here but it is hoped that the above will give some indication of the work of this man who quite modestly describes himself as a heraldist. Laurent is at present studying a late 15th century (and still unknown) armorial owned by an eminent French manuscript col-lector. His studies include heraldic frescos of the 16th and 17th century on the walls of a major archaeological site in Lyon (France) -the Hotel of the Chamarier. This study is on-going. It has been a pleasure to feature the works of Laurent Granier. The much reduced illustrations shown on the pages of this newsletter do not at all do justice to his many works.